In addition to the F-35, the Royal Netherlands Air Force (RNLAF) is in the process of introducing yet another new weapon system: the MQ-9 Reaper. 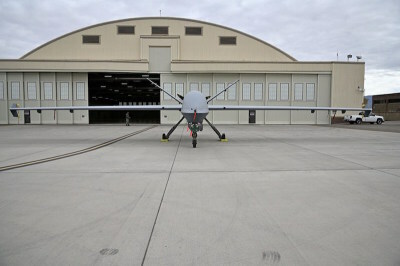 Four MQ-9A Block 5 devices have been ordered that will be delivered from the fourth quarter of this year. They are the first unmanned aircraft in the history of the RNLAF, which is taking a whole new path. The first four aviators are now training at Holloman AFB in [New Mexico]: two pilots and two sensor operators. The word 'unmanned' actually gives the wrong impression, as if the aircraft was controlled by robots and people no longer play a role in this. But nothing could be less true. The MQ-9 is controlled by a pilot, while a sensor operator controls the observation systems. They sit next to each other in a 'Mission Control Element' that has a satellite connection with the Reaper in the area of operations, which can be thousands of miles away. Because of this large distance, the signal takes a while to reach the aircraft, and that delay is just too long to be able to safely control the aircraft at take-off and landing. That is why a 'Launch and Recovery Element' is placed in the operations area that takes over these crucial phases of the flight.